Swansea City striker Michu is hungry for more goals after ending his mini-scoring drought with a brace in the 4-1 home win over Queen's Park Rangers. The Spaniard, 26, had not scored for six games but against strugglers QPR took his tally for the season to 18. "That's good, but I need to score more," said Michu, whose last goal came in the Capital One Cup win at Chelsea. "I went a lot of games without a goal, so it was important I could get two goals and the team scored four." Michu, a £2.2m summer buy from Rayo Vallecano who has since been rewarded with a had opened his Swansea account on the first day of the season with two goals in the 5-0 win at QPR. He repeated that dose on Saturday as Rangers, under Harry Redknapp's charge since the sacking of former manager Mark Hughes, succumbed once again to Michael Laudrup's side. "QPR brings back good memories for me because I scored two goals on my debut against them, and I managed another two this time," Michu told the Swansea website. "For the first goal I could see Nathan [Dyer] was going to shoot, so I hoped the goalkeeper would spill it. It was a difficult chance to take, but I managed to get it into the net. "My second goal came from a brilliant pass from Pablo [Hernandez]. I know Pablo, Wayne Routledge and Nathan can make this type of pass so I make the run knowing they will find me." Michu followed up Dyer's shot to open the scoring before Angel Rangel doubled Swansea's lead, firing home after QPR goalkeeper Julio Cesar parried his first effort. Rangers substitute Bobby Zamora replied after the break as the visitors briefly threatened a comeback. But Hernandez weaved through to score from an acute angle and Michu then capped a fine win, holding off Christopher Samba to gather an exquisite through-ball from Hernandez to curl into the corner with his left foot. "We played very well in the first half. We scored two goals and they didn't have a shot," Michu added. "They came back straight away in the second half, but we did well to score straight away through a very good goal from Pablo. "Then the fourth goal came and that finished the game." Despite his good form this season for Swansea, Michu was left out of the Spain squad for a recent friendly. 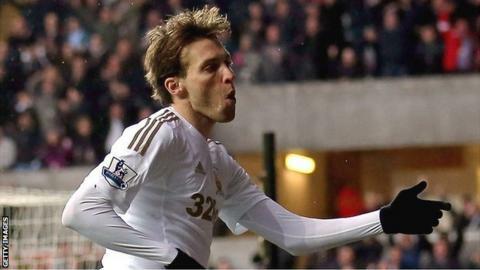 However, compatriot Rangel believes that Michu's performances continue to prove his talent to Spain manager Vincente del Bosque. "Not getting called up for Spain, it was very upsetting for him because I think he deserved it," Rangel told BBC Wales Sport. "Everybody knew it here, in Spain, everywhere, except for the national coach [Del Bosque]. "I said that was going to motivate him even more to score more goals and he was desperate to score again, he had gone without scoring for a few games but that's football. "He can't be scoring in every game, not even [Manchester United and Netherlands striker Robin] Van Persie does it. "So it was great to see him [Michu] get two, putting in a great performance again."